With a view like a private resort this second floor condominium residence is overlooks the swimming pool and nature preserve. 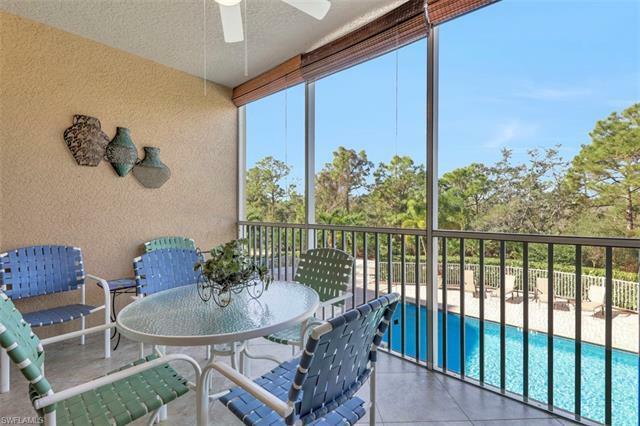 It is perfectly situated in a convenient area of Bonita Springs, Florida. The Carlysle is west of 41, close to shopping, a stone’s throw to local restaurants and a short drive to Bonita Beach. The large kitchen is open to the living/dining room and features a breakfast bar. It’s the perfect space for entertaining! Kitchen features beautiful wood cabinets, granite countertops and stainless steel appliances. The spacious master bedroom has slider to lanai, a window overlooking the pool. Complete with two walk-in closets, the master area also features a spacious bathroom with dual sinks. The floor plan is very versatile; the den can be also be used as an office, TV room or formal dining area. Low maintenance, neutral toned tile throughout!. Additional features to mention about this complex include the common elevator and the impact glass which provides security, storm protection and makes for a very quiet residence. Community amenities include a community pool, barbecue area, covered parking under the building #202 and a walking trail around the lake. © 2019, The data relating to real estate for sale on this Website come in part from the Broker Reciprocity Program (BR Program) of M.L.S. of Naples, Inc. Properties listed with brokerage firms other than Dowing Frye Realty, Inc. are marked with the BR Program Icon or the BR House Icon and detailed information about them includes the name of the Listing Brokers. The properties displayed may not be all the properties available through the BR Program. BR data on this website is provided by Dowing Frye Realty, Inc. on behalf of Chris Griffith. The source of this real property information is the copyrighted and proprietary database compilation of the M.L.S. of Naples, Inc. Copyright 2006 M.L.S. of Naples, Inc. All rights reserved. The accuracy of this information is not warranted or guaranteed. This information should be independently verified if any person intends to engage in a transaction in reliance upon it. Data last updated 2019-04-22 15:50:23.